Rick Egan | The Salt Lake Tribune Ashley Hatch (33) BYU, celebrates her goal, along with Madie Siddoway (21), BYU, in soccer action, BYU vs. Utah, at the Ute soccer field, Monday, September 5, 2016. 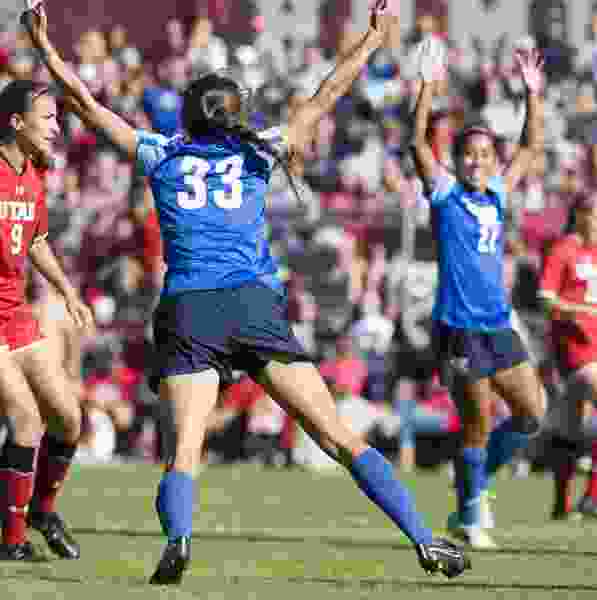 Provo • The way coach Jennifer Rockwood sees it, BYU’s women’s soccer team is back where it belongs — in the NCAA tournament. Having missed the tournament last year for just the fifth time in the program’s 24 years, all with Rockwood at the helm, the Cougars will meet TCU in a first-round match on Friday at the Horned Frogs’ home stadium in Fort Worth, Texas. This year, they did. The Cougars (13-4-1) have won five-straight matches and claimed the West Coast Conference title outright with last week’s 2-1 win over Loyola Marymount. Former Mountain West Conference foe TCU (12-4-3) tied for third in the Big 12 and is also known for having a high-scoring attack. Rockwood was named WCC Coach of the Year after the Cougars were picked to finish third in the preseason poll. Elise Flake and Mikayla Colohan were named to the All-WCC first team while Rachel Bingham Lyman and Alyssa Jefferson made the second team. Sabrina Macias Davis and Olivia Wade earned honorable mention and Wade and Bella Folino are on the All-Freshman team. The team has only one senior, forward Madie Siddoway Gates, so Rockwood believes they could be starting a new streak of NCAA appearances.